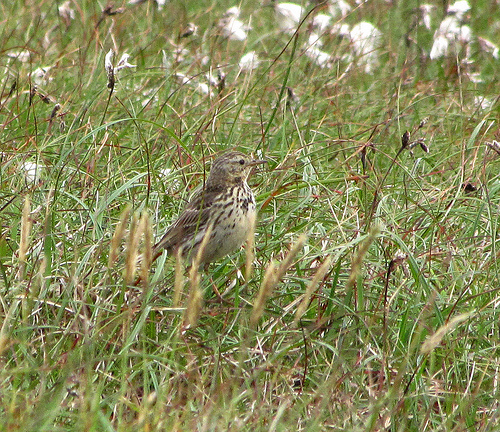 The Meadow Pipit looks a bit like a Skylark, but is mainly seen on the ground. The silhouette of a pipit is much more like a wagtail or a small thrush. 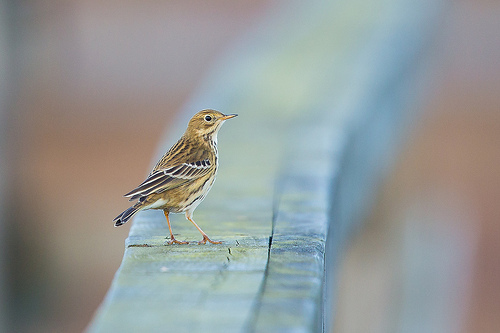 The Meadow Pipit is slimmer and has a longer tail. The Meadow Pipit doesn't have the characteristic minutes-long song of the Skylark. Meadow Pipits and Tree Pipits only differ in some small details. Fortunately the songs are very different. The Meadow Pipit ends its song with a characteristic decrescendo tyu-tyu-tyu-tyu, while the Tree Pipit has a melodious song.